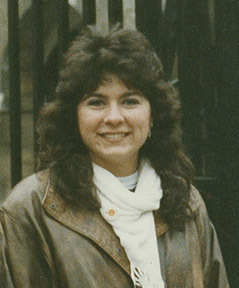 Suzanne Marie Miazga (1966-1988) was among the 270 victims of the bombing of Pan Am Flight 103 over Lockerbie, Scotland on December 21, 1988. She was a graduate student earning her master's degree in social work from Syracuse University's College of Human Development. Suzanne was returning from a semester in London, during which she had worked as a counselor in the drug dependency unity of St. Mary's Hospital. Suzanne had also worked as a counselor for drug and alcohol abusers at the Benjamin Rush Center in Syracuse. She was remembered by coworkers as congenial and intelligent. "She was marvelous. She was able to establish a great rapport with patients." Suzanne saw traveling to London as a chance to grow. In a letter home to her mother she said she wanted to "live life and not just exist." Her time overseas allowed Suzanne the opportunity to see other parts of Europe, as well. She traveled to Italy during a visit from her mother; visited France; and spent time in Switzerland with friends. Suzanne wrote in her diary about her trip through the Alps, remembering it as one of the highlights of her time abroad. Originally from Utica, New York, Suzanne was an alumna of Mohawk Valley Community College, where she majored in family services. She later earned her bachelor's degree from Syracuse University, before continuing on to work on her graduate degree. Suzanne was also a licensed real estate agent. She was survived by her mother, Anna Marie; her father, Richard; and two sisters, Judy Dios and Linda Smith. Audiovisual contains a recording of "As I Turn to the Father," a memorial song written by Pam Majka, as well as the lyrics of same. Clippings includes articles about Suzanne Miazga, the investigation of the bombing of Pan Am 103, the trial of Abdel Basset al-Megrahi and Lamen Khalifah Fhimah, and other topics relevant to the aftermath of the tragedy. The clippings are arranged chronologically, with items from a clippings scrapbook being maintained in their original order. Correspondence consists of primarily incoming correspondence to Suzanne's father, Richard Miazga, and is arranged alphabetically by correspondent. Files include letters and cards of condolence; correspondence with Syracuse University; letters from various government offices; and information about the Suzanne Miazga Memorial Scholarship at her high school alma mater, Oriskany Central School. Coursework contains one item: "The Road to Prosperity" board game created by Suzanne in 1987 as a class project. Legal files from Speiser, Krause, Madole, and Nolan related to litigation against Pan American World Airways, Inc. comprise the bulk of this series. Memorials and services contains materials pertaining to various memorial services for the victims of Pan Am 103 in the United States, Scotland, and at Syracuse University. Photographs includes a small selection of photographs of Suzanne, including photographs from her semester abroad. Writings consists of a copy of Suzanne's diary from her semester in London. Materials pertaining to the Victims of Pan Am Flight 103, Inc., Families of Pan Am 103/Lockerbie, and the Remembrance and Lockerbie Scholars have been separated and placed in the appropriate collections. Audiovisual materials have been placed in the Pan Am Flight 103 Audiovisual Collection. Legal files from Julian & Pertz are restricted, and have been removed from this collection. The Suzanne Marie Miazga Family Papers were donated by Richard Miazga in 2008, and Anna Marie Miazga in 2010. The Suzanne Marie Miazga Family Papers are fully processed. Clippings originally contained in a non-archival scrapbook have been removed and placed and in acid free folders for preservation purposes. Files are arranged alphabetically within each series with the exception of the Clippings series, which is arranged chronologically. Box 4 Suzanne Miazga's diary 1988 Photocopy of original.